This week I’ve been sewing 18 pillowcases for Christmas gifts for family members — everyone is getting two pillowcases each because I had lots of fabric! 2. 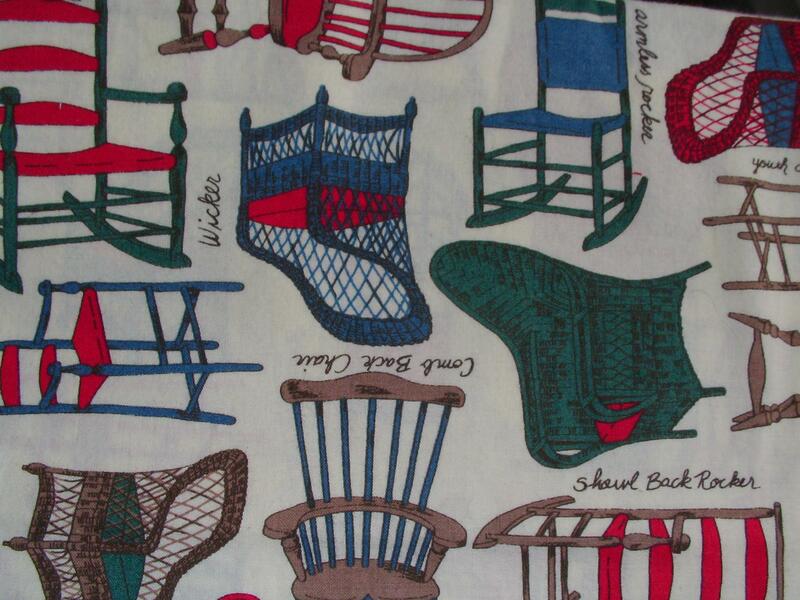 Mary Lou Weidman’s pattern at the Benartex website, Bee Happy Pillowcases, which works well with smaller pieces of fabric and looks fine with overcast or serged seams. Is this naughty? I’m thinking that since I’ve reached my goal and exceeded it a little bit, I could even buy some new fabric before the end of the year without getting myself in too much trouble. My stash of neutrals and backgrounds could use a boost. To see how others are progressing with Stashbusting this week, please visit Judy’s blog. 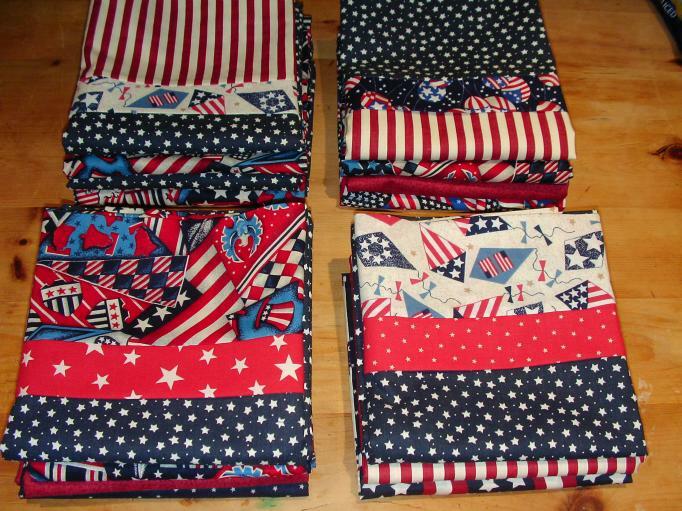 I have found the Quilts of Valor group for the UK, thanks to information from one of the American QOV coordinators, and I have now joined them as a volunteer. 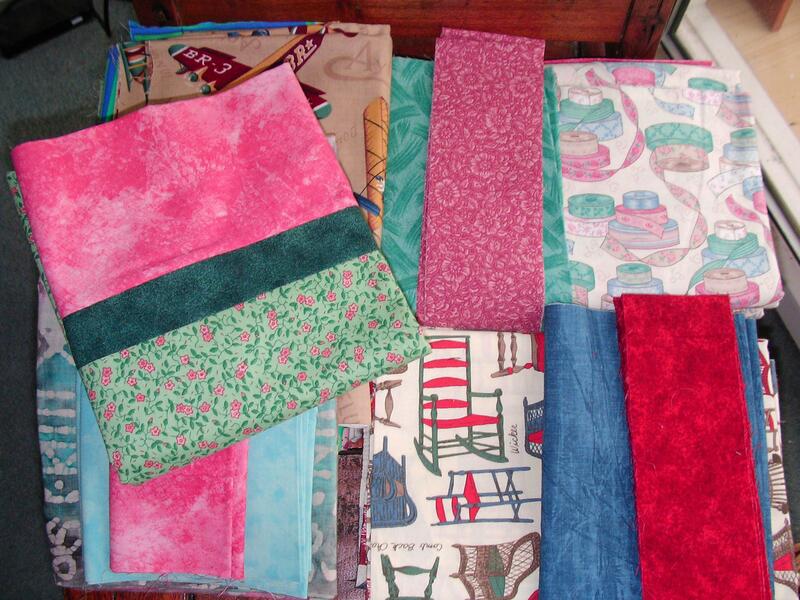 I am going to make quilt tops and pillowcases. Contact details for the UK coordinator can be found on the main Quilts of Valor website, along the lefthand side of the Home page. Or you can contact me, and I can give you the email address. I am so excited about the opportunity to participate in this worthwhile and uplifting project. I am an American, and I was very happy to have made a few things for the American group. With the UK group, I will now be able to show my appreciation to service personnel in the country where I presently make my home with my wonderful family. If you live in the UK and have been thinking about doing some volunteer quilting work for a worthy cause, please think about joining Quilts of Valor – UK. My first project? Well, I have these beautiful Makower coordinates just languishing in my stash…. This morning I finished my first HeartStrings Quilt top, using scraps left over from the Quilts of Valor pillowcases made during November’s Pillowcase Party. This is going to be posted to Alycia, who is working on a mighty QOV project to personally deliver 400 quilts to the project in May 2009. She will finish it into a proper quilt with batting, backing and binding. We went outside to take advantage of the lovely January sunshine, and my husband and teenage daughter held the quilt up for me to photograph. I used 6 yards of fabric for this quilt top. The centre lattice strips are blue Kona cotton purchased on our last trip to America a few years ago, and all the strips are pieced onto muslin squares. Now I can’t wait to get started on something new! We were out of town from Boxing Day (Dec. 26) until the New Year, so I didn’t get back to work on the quilt until January 2. Then I discovered that I had made some really terrible mistakes in my machine quilting, and all my stitching had to be unpicked. This is the largest quilt I have ever made, and the safety pin basting just wasn’t adequate. The layers had shifted, and there were big wrinkles in the backing. What to do, what to do…. So I decided to go for it, bought some architrave boards (door facings) from the home improvement shop, put the two extra leaves in the dining table, and set to work. It only took me a little while to get the hang of this technique, and I had the whole quilt *securely* basted and ready for quilting in less than two hours. 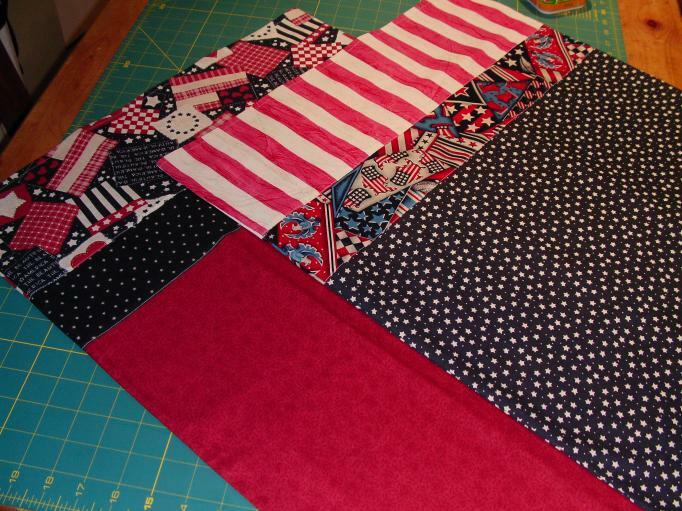 This method worked so well for me that I plan to do all my quilts this way in the future. I kept several needles pre-threaded for basting each round, and this made the work go quickly. Stopping to re-thread needles also gave me a chance to rest my hand, as I have a bit of arthritis and hand stitching can be difficult sometimes. I haven’t learned yet how to do fancy machine quilting (although it’s on my list for 2009), so I used one of the decorative stitches on my sewing machine to outline each seam. 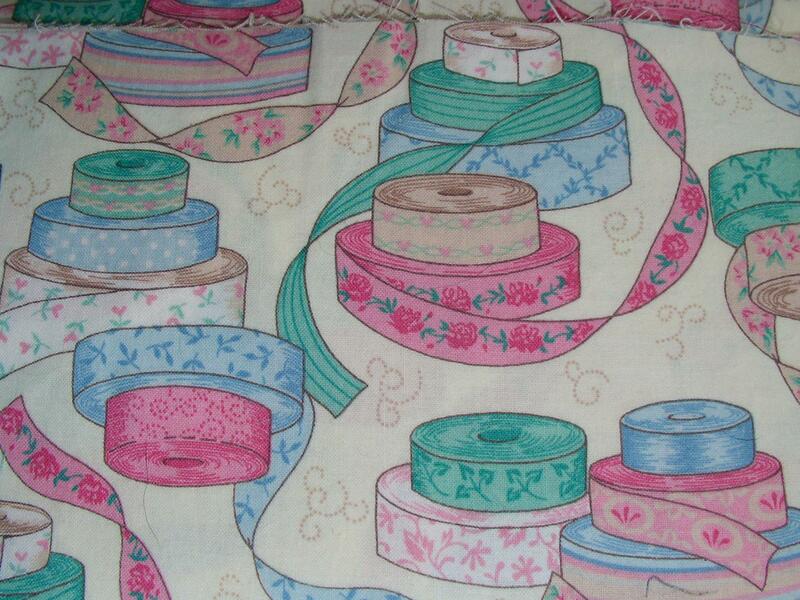 My sewing machine is a Janome 6500P, and the stitch I used is Mode 2 Quilt, Stitch No. 50. It’s sort of like a stretched out zigzag with bar tacks, and I was pleased with the way its geometric pattern suits the quilt design. I like the way the back looks, too. I cut 2.5 inch strips from my scraps and joined them together to make the binding. I laid the finished quilt out on a bed to photograph it. This bed is a UK King size (USA Queen size), so the quilt will be just the right size for a standard double bed. Then all I had to do was make the pillowcases (from Mary Johnson’s pattern), and the quilt label, which is framed with red scraps and has the information handwritten with permanent marking pen. I added more blocks to make it double-bed size (30 blocks, set 5×6). The backing fabric was bought especially for this quilt because I had nothing suitable at home, but everything else came from my stash — all the fabric for the top, the piecing thread and quilting thread (YLI Select), and the batting (Soft & Bright needled polyester batting from the Warm & Natural company). 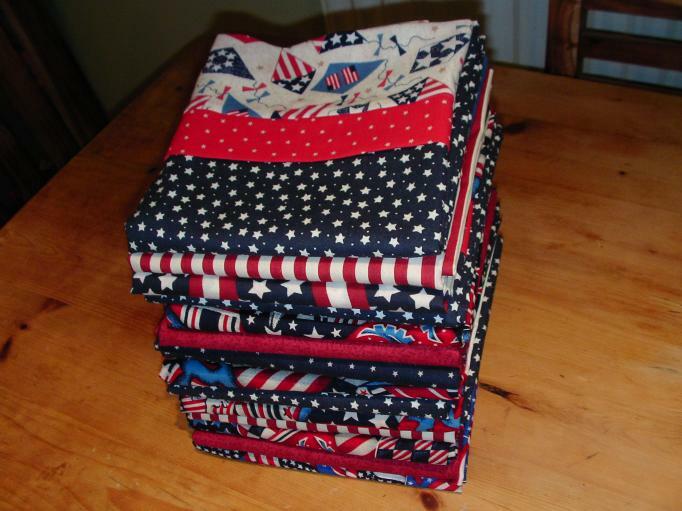 I finished all my Quilts of Valor pillowcases today and used up almost every bit of patriotic fabric in my stash! There is nothing left now but one shoe box of strings, which will probably find their way into a string quilt later on. I had enough fabric for 15 standard size pillowcases. Patriotic fabric was not a requirement for the Pillowcase Party, but I had a huge stash of red-white-and-blue and thought this would be a great use for it. I had a wonderful time doing this — I learned a new skill, cleared some space in my fabric cupboard, and got to join in with the online group HeartStrings Quilt Project in a team effort for a worthy cause. QOV Pillowcases — 3 More Completed! 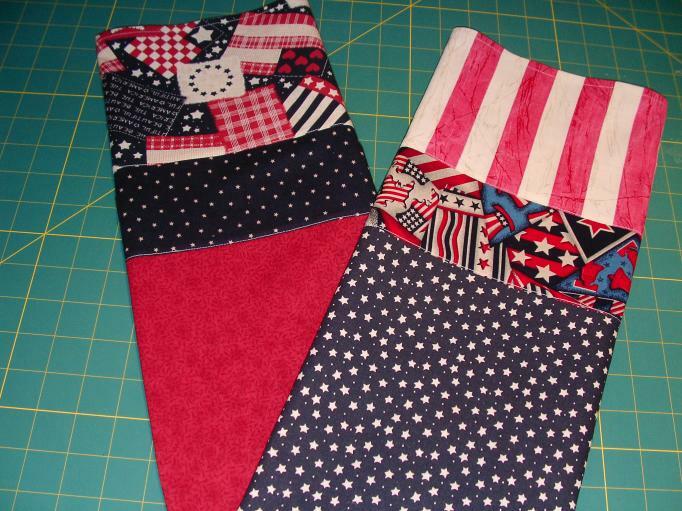 Three more pillowcases completed for the Quilts of Valor project! I am hoping to have 12 finished by the end of the weekend. I couldn’t understand the directions for this technique until I saw Mary’s photos on her tutorial, and then it was suddenly clear. Thank you, Mary! This is a wonderful pattern and works well if you have large pieces of fabric (27 inches x Width of Fabric, and strips 9.5 and 2.5 inches x WOF). It’s beautifully finished with enclosed seams and has a faced cuff. This pattern is excellent if you have smaller pieces of fabric (20.5 x 20.5 inch squares and strips 4.5 and 2.5 inches x 20.5 wide). I experimented with making the cuff and accent strips wider to make a longer pillowcase, but discovered it’s better to make the body longer, say 23.5 inches long x 20.5 inches wide instead. 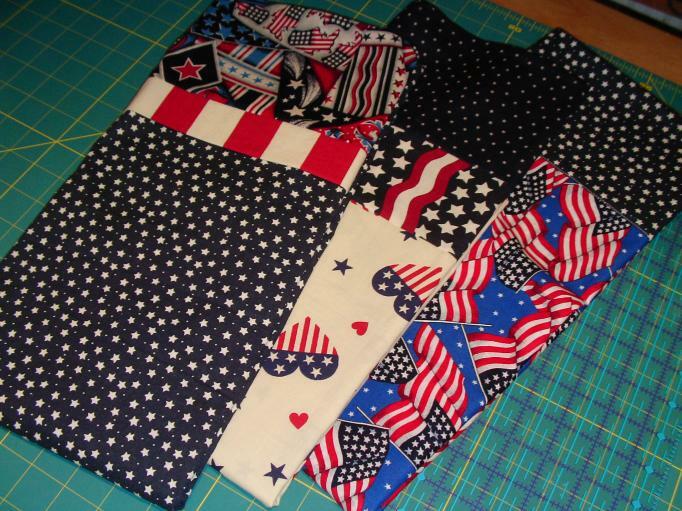 Most of my patriotic fabrics were fat quarters, or treasures from remnant bins at fabric stores in my old neighbourhood in Texas. The pillowcase on the right is from a suggestion by one of the members of the HeartStrings list. She said to use approximately 27 inches x WOF for the body, and approximately 9 inches x WOF for the cuff. I cut mine 9.5 inches, turned up 1/2 inch for a hem and then folded the cuff in half to make a facing and conceal the top seam. I zig-zagged to overcast the side and bottom seams. This pillowcase turned out nicely too, and I didn’t have to think too much about what I was doing.